Another closing bell. Another record close. It's not even news anymore. The long-forgotten Dow Jones Industrial Average is again everyone's favorite "broad" measure of stock market performance (after a 25-year hiatus), now that this is what the president refers to as "the market", and now that this index of 30 of the bluest chip stocks has closed at a record for nine consecutive sessions. By the way, the all-time record for consecutive closing highs is 12, and if you think that you can't remember that far back, it was done most recently this past February, when American children regularly went to bed at night with visions of 4% GDPs, and "massive" corporate tax reform dancing in their heads. What Americans did get was almost as useful, at least for firms with the most overseas exposure, and that has been a cheaper U.S. dollar. The greenback is down a rough 8.7% on the year when measured broadly against the weighted basket of foreign currencies known as the US Dollar Index (DXY). That basket is most heavily weighted against the euro, which in isolation is around 12% stronger vs. the U.S. dollar year to date. The DXY is currently bouncing around the 93 level. Short positions versus the US dollar are being made a big deal of right now. Bearish bets against the U.S. dollar have reached an aggregate $7.9 billion as of last week, according to the CFTC. This collective negative bet against the U.S. dollar is at its largest total since 2013. We all know that the DXY spent most of 2013 flirting with the 80 level. The DXY took off to higher levels in 2014 only when it became apparent that the Fed was going to halt its quantitative easing program. What do traders think? The 80 spot on the DXY suggests a U.S. currency that could have a long way to go to the downside. The large bearish position, and the imminent change in monetary policy that will likely come to be known as quantitative tightening, or balance sheet management, suggest a turning point in the U.S. dollar valuations. Hmmm. What does this trader think? I think that Mario Draghi's speech at Jackson Hole will be decisive in the short-term. Markets are looking for a signal regarding the ECB's own program of monthly asset purchases. Europe is doing much better than it has in quite some time versus where the continent was not too long ago. What are the chances of a Draghi dovish surprise? I wouldn't bet the farm on anything. You know he will get hammered at home if he says anything that takes the euro higher. A DXY sinking into the 80s infers a euro that approaches $1.28/$1.30. As defense, I suggest either broad diversification, or simply a lighter book for top heavy net long portfolios. I will choose the latter. The symposium is scheduled for August 24-26. Just what do we make of Tesla (TSLA - Get Report) ? We often speak of run-away valuations. We often debate the possibility that the FANG -- Action Alerts PLUS holding Facebook (FB - Get Report) , Trifecta Stocks name Amazon (AMZN - Get Report) , Netflix (NFLX - Get Report) and Google parent Alphabet (GOOGL - Get Report) -- names might be overvalued. Then, we always come back to the point that for the most part, FANG make money, and outside of NFLX, the rest of this fabled group all can post a positive number for Operating Cash Flow. Not so for TSLA. There are times when the FANG acronym that Jim Cramer invented years ago includes that extra A for Apple (AAPL - Get Report) . AAPL could be included, but at times trades much more like a value stock. AAPL trades at less than 15 times forward earnings, and can boast significantly higher operating cash flow than can any other corporations mentioned in this segment of the Recon today. AAPL even pays a dividend, for crying out loud. Back to TSLA. Tesla can claim a 25% gross margin on every car it sells. Still, for the quarter just reported, the firm lost $336 million. This loss comes after figuring in $2.3 billion worth of sales as well as the sale of $100 million worth of "zero emissions" tax credits to the other auto manufacturers. Now, about the crafty CEO, Elon Musk. 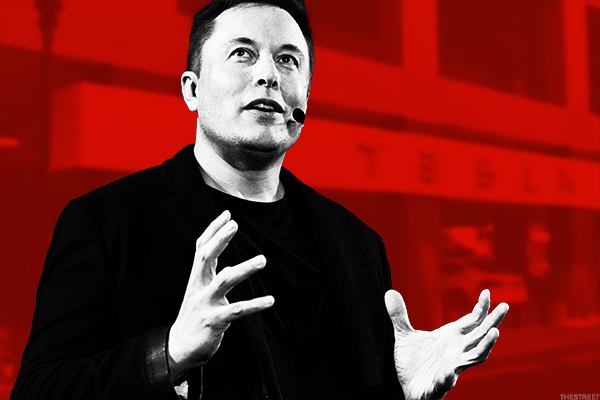 If you watch the monthly Trading Strategies roundtable at TheStreet, then you have heard me marvel at Elon Musk's ability to raise money more than once. This time, he really outdid even himself. The straight debt issue that made headlines yesterday is expected to raise $1.5 billion without the dilution impact that a secondary equity offering would have brought with it. Nor does it bring the complications that a convertible debt offering implies, such as did the $1.4 billion raised earlier this year in such fashion. This latest offering will increase the amount raised by the firm to $2.9 billion this year, and to $7.9 billion since the start of 2014. Am I negative on TSLA? You could say that. I am short the name -- not large, and completely manageable, but enough to tick me off. Let's put that out there, so you understand my bias. Negative. Standard and Poor's rates the firm's debt at B-, which is sub-investment grade. Positive. Rates are low, and the markets love this guy. Negative. Tesla just burned through $1.0 billion in cash in the latest quarter, and has projected capital spending of another $2 billion over the rest of the year. Positive. Musk navigates financial markets like he was born to do it. Negative. Marketing materials for this latest bond offering warn of possibly significant delays during the launch, and production processes for new vehicles. Lastly, the firm admits to having "no experience" in manufacturing vehicles at high volumes. Hmmm. This one, as I mentioned, is against me. As for "FAANG", this proved to be an excellent earnings season. I played each and every name in the acronym, and that has left me with a cushion to let this position run. I remain long AAPL, as I consider that one to be investable, and the rest of "FANG" to be more tradable. TSLA found support at the $370 level for the month of June, before selling off a bit. I will allow the name to run as far as $375, before I take my ball and go home. Remember, it's always more about risk management than it is about wins and losses. For those folks out there who don't like to miss a thing, you did not miss the Fed's release of the Labor Market Conditions Index yesterday. The Fed, possibly having noticed that the results of this series did not always jive with the official story coming from the central bank, has decided to simply terminate the series. In the Fed's statement on the matter, they say in somewhat confusing manner "including average hourly earnings as an indicator did not provide a meaningful link between labor market conditions and wage growth." Sometimes, you just have to laugh. 06:00 - Small Business Optimism Index (July): Actual 105.2, June 103.6. While never seeing any serious erosion in small business optimism since the election of Donald trump to the White House, this series showed an unexpected boost in July to levels not seen since February. Small business included in the survey showed a real appetite for increasing employment, as well as increased expectations for their own sales and for the broader economy in general. 08:55 - Redbook (Weekly): Last Week 2.8% y/y. This measure of chain store sales rebounded last week to equal its highest year-over-year growth of the year. The best part is that this data-point did this without piercing 2% to the downside during a downturn that lasted two weeks. A print that started with a 3 would be an extremely optimistic sign going into "retail earnings season". 10:00 - JOLTS (June): Expecting 5.63 million, May 5.67 million openings. This series runs with a lag, so it never really impacts financial markets. That said, we do know that this is one series that Janet Yellen and the entire FOMC do keep their eyes on. At the time of publication, Stephen Guilfoyle was long DIS, AAPL, short TSLA, DIS out-of-the-money calls, although positions may change at any time.